Who do they have to watch over their backs? The oceans are home to a vast number of animal and plant species that make up a food chain characterized by the dynamics of food species. Large, carnivorous species such as the great white shark (Carcharodon carcharias) and the whale (Orcinus orca) are positioned at the top of the chain, being apex predators. But not all species are large predators. For example, manta rays reach more than 3 meters wide in disk, but have no need to wade into the sea in search of big prey to make them their food. No, manta rays are filtering fish whose diet is based on consumption of zooplankton, animals so tiny that they’re not even chewed. While manta rays are not exactly the terror of the seas, they are not the object of desire of large predators. Fortunately for them, few animals dare to address them, because its huge and threatening size often deters almost any animal. 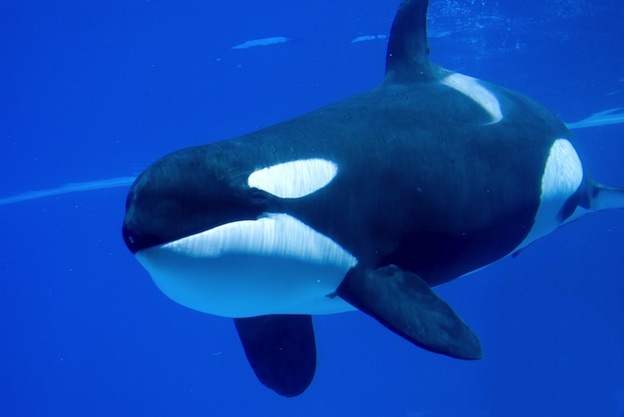 In the wild they may be victims of attacks by large sharks, killer whales and false killer whales (Pseudorca crassidens), according to reports. Species of sharks that have attacked are the tiger shark (Galeocerdo cuvier), the great hammerhead shark (Sphyrna mokarran) and the bull shark (Carcharhinus leucas). Killer whales and false killer whales are toothed whales species, both of the dolphin family (Delphinidae). The orca, often called killer whale, is known for its tremendous efficiency to hunt up to the fearsome sharks, why would they get scared from a peaceful manta ray? For its part, the false killer whale is smaller but is able to hunt animals and various other cetaceans. Some individuals may also be attacked by the small but scary Cookie cutter shark (Isistius brasiliensis), something like “Cookie-cutter-shark” for its style of attack: it adheres to the skin by suction and starts spinning on itself to then tear off a piece of meat, leaving a distinctive round mark. Predators are different between regions and species. The reef manta (Manta alfredi) can fall victim to sharks and killer whales, sharks while only dare to attack the giant manta ray (Manta birostris). In the Maldives the attacks are very rare, and a lower percentage of 10 percent of the population exhibits signs of attacks and scars. But in Mozambican waters, more than 70 percent of reef manta rays show shark attack marks. When manta rays survive an attack it’s normal to result in serious injury. Individuals have been missing large pieces of meat significantly as a result of bites. But these fish have a point in their favor: their tissues regenerate incredibly fast. An injury can heal at high speed and a section with a torn off piece of meat can be regenerated almost completely weeks later. This recovery process is often aided by some cleaner fish that are gladly responsible for removing dead tissue. A more dangerous predator is man. Its main anthropogenic threat (derived from human activities) is direct catch or bycatch; the latter occurs when trapped in nets targeting other species. However, the capture and trade of parts of manta rays is important in some countries, because their gill rakers are in demand for use in traditional Chinese medicine and its meat can be eaten. It is true that commercial exploitation is not high as in the case of other fish, but their low reproductive rate makes them more vulnerable to threats. Manta rays don’t have a poisonous sting in the tail or sharp teeth to tear flesh. They often rely on their large size to avoid predators, but if these are insistent they are able to swim quickly to flee. When the flight is insufficient they have no choice but to use their thin tail as a whip to scare the attacker.